Don't let the name fool you. 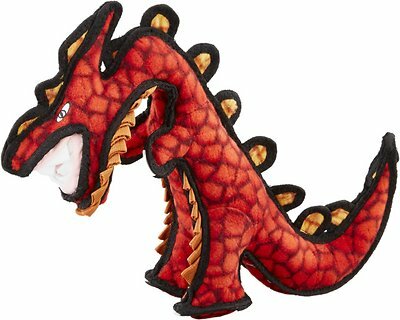 Tuffy's Destructosaurus Dino Dog Toy is better at taking abuse than dishing it out. 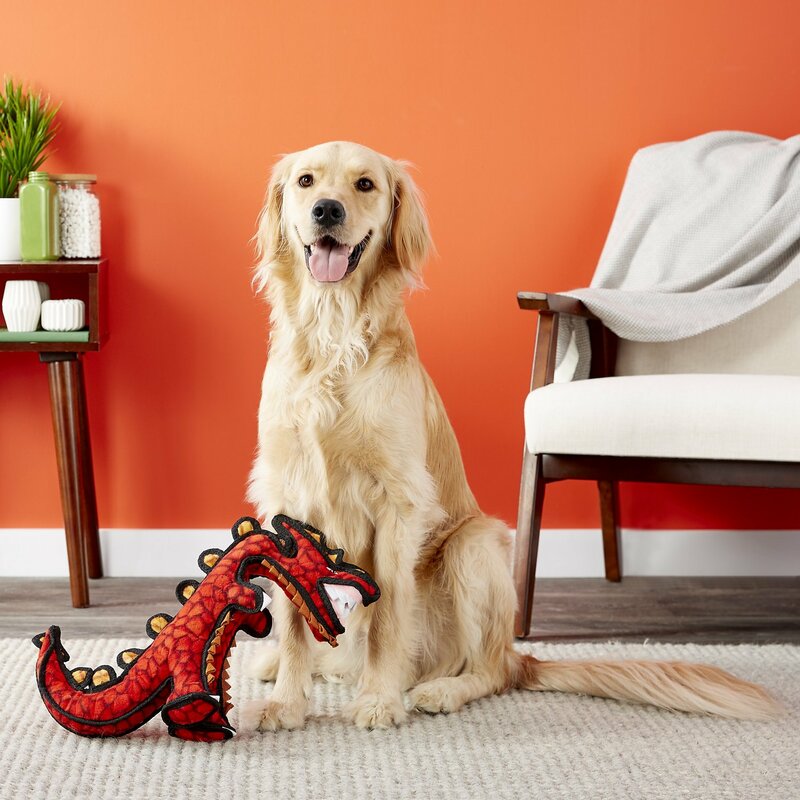 It’s made with three layers of safe, non-toxic fibers, and all three are fused and sewn together to make one ultra "tuff" layer, ensuring this toy is just as durable as it is fun. And because paleontologists believe Destructosaurus was equally at home lounging in the living room or playing at the pool, this Dino toy is made to float! 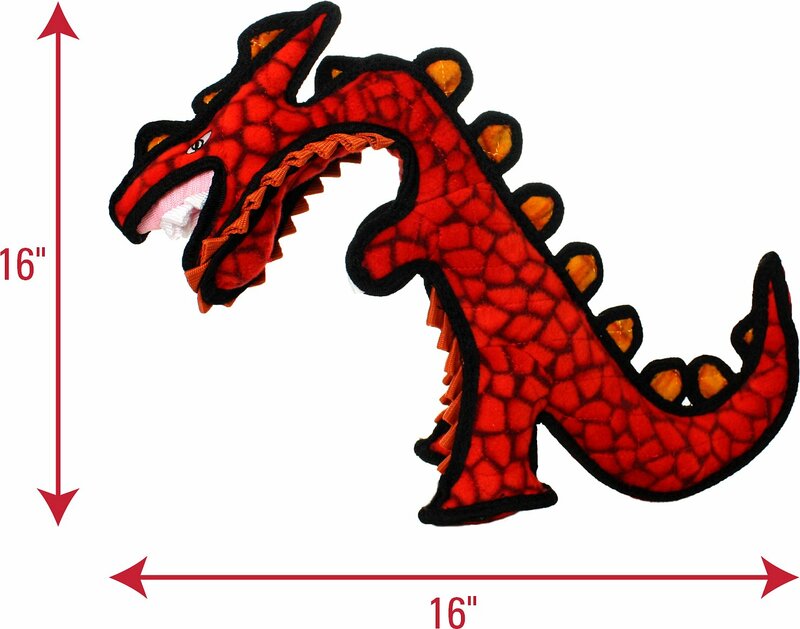 For interactive play with one or multiple dogs—and the junior size has one squeaker. A 1 year old miniature bull terrier is a force for toys to reckon with. Nothing survives. But these Tuffy toys hold out better than any other. Especially the more complicated creatures with lots of appendages. Even after the squeakers and most of the guys are gone my pup carries the toy around and cuddles it, kills it and plays tug with his brother bully with it. So we dean it a great success. My 75lb Airedale loves to carry toys around in his mouth. He has the Tuffy Peacock which is his favorite, and he has started carrying that one outside, so now it is an OUTSIDE toy. I bought this one to replace it for inside.. He doesn't like it as much as the peacock,,,maybe bc it isnt as easy to hold in his mouth?? idk.. but he does grab it and run around. no holes in it, we play tug of war etc..
My six month old Newfie is struggling to tear this one up. Sewn very well and worth the price to have something lasting so long. Usually there torn up in a couple days. Not this one! I have bought my dog these toys for awhile. They say that they last years but my dog can chew them up in weeks. I have a pitbull and I want him to have toys that can last for awhile. If you have a big dog that likes to chew though things I only recommend this toys for a short period of time. Bought for my rottie who has torn through EVERY toy we have ever bought him. Didn't want to spend the high price for it but thought if it held up it would be well worth it. Even if it held up for a a few weeks I would of been happy. But only lasted 30 minutes and lake had it torn. I got this for my Great Danes 1st birthday and it lasted exactly 15 before she tore it to pieces. She's not overly hard on toys and doesn't tear them up just to do it, that being said it I thought the quality was poor. This may be a great toy for a chihuahua but nothing larger. i had my doubts about paying this much $ for a toy but it has really been worth it - all of our dogs and even one of our cats love this thing. Mind you, it's roughly 4X the size of the cat but it's apparently compelling, nonetheless. my mastiff cross and my PWD usually go thru toys in short order but we've had this one for months and they haven't been able to make much of a dent. They DO drag it around with them and love to play with it and nibble on it - it's just THAT durable.